In an exclusive April 29, 2011 interview on ExopoliticsTV (below video) with Alfred Lambremont Webre, Robert Stanley, weekly correspondent for the Washington Times investigative radio, states that the purported birth certificate released by U.S. President Barack H. Obama on April 27, 2011 is a forensic forgery. In the interview, Mr. Stanley's statement is accompanied by an on-camera demonstration of various forgeries within the nine overlaid digital layers of the birth certificate document as released on the White House website. Earlier on April 29, 2011, Mr. Stanley reported the breaking news (listen below media) regarding the forensic fraud in Mr. Obama's newly released birth certificate on Washington Times investigative radio's America's Morning News while being interviewed by reporters John McCaslin and Amy Holmes, also a commentator for CNN. As of this writing, Mr. Stanley stated there had been no overt comment from the White House other than the taking of the birth certificate offline. Neither officials of the Hawaii state birth registrar nor of the Honolulu hospital where Mr. Obama allegedly was born have, as yet, commented. Mr. Stanley stated that the headquarters of Donald Trump had put him in touch directly with Mr. Trump, and that he had forwarded the evidence of forensic forgery in Mr. Obama’s birth certificate directly to Mr. Trump. Donald Trump, a possible contender for the 2012 Republican nomination for U.S. President, stated on April 27, 2011 that he considers himself instrumental in forcing Mr. Obama to release the alleged birth certificate, and now apparent forensic fraud. During this 25 minute ExopoliticsTV interview, Mr. Stanley graphically demonstrates using copies of various of the nine overlaid digital layers within the forensically fraudulent birth certificate of Mr. Obama that the birth certificate was assembled as a forged document, using components of many other documents. Proof Obama's 4/27/11 "Long Form Certificate of Birth"
Researchers have identified a number of anomalies on the alleged birth certificate of Mr. Obama, apart from the evidence of forensic forgery provided by analysis of its nine layers. "Look at the hospital name on this document [Mr. Obama's alleged birth certificate]. The hospital had a different name in 1961, it was not named Kapiolani Maternity and Gynocological Hospital, it was called Kaokiolani Children's Hospital. It did not get the Kapiolani name until the mid-1970s when they merged. Kenya was not called 'Kenya' in 1961 it was called 'The British East Africa Protectorate' at the time Obama was born and this document was supposedly printed. Then in 1963 it became 'The Dominion of Kenya'. Then later on became the 'Republic of Kenya'." "I’m not going to say that the information on the document is bogus, but I can definitely, without hesitation, say that the document was originally a two-layer piece. The top layer is the ‘black’ part that came from a scanner as a grayscale scan. It was converted to black and white and the white part was made transparent. "That was dropped onto a generic green watermark background, which is what makes it look official. But that was NOT on the original document as scanned. This is very evident by the white haloing around everything black. It is also extremely evident that a layer was dropped onto the green background because the green marks are very crisp in the areas around the edges of the image, but are very blurred where the black image block covers it. "Now keep in mind that before the green background was added, the original scan could have easily been altered, dates or names changed. I’m not saying it was. I’m just saying it’s a 100% fact that it could have been. So, this document as we see it is still not proof of anything. I could easily recreate this document with someone else’s original Hawaii birth certificate and a generic watermark background." "It centers around the fact that two twins born in the same Kapi’olani hospital listed on the Obama document the day after Obama was purportedly born actually have birth certificate numbers lower than Obama. The number should be lower on the Obama certificate if he was born before the twins." 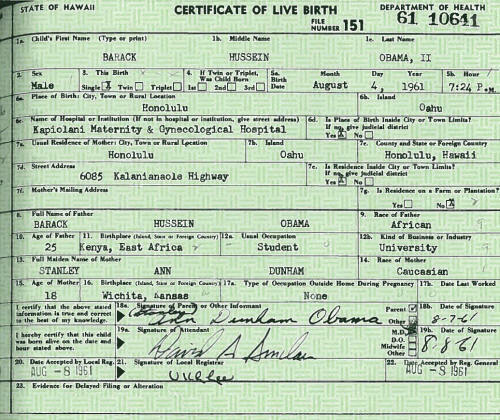 Why was a forged Obama Hawaii birth certificate necessary? 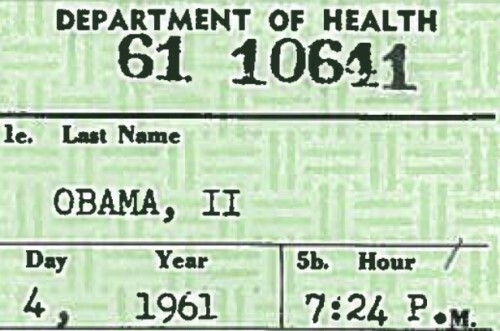 The forgery of Barack Obama’s Hawaii birth certificate appears to have been made necessary by U.S. immigration and naturalization law in the period between 1953 and 1986. Between Dec. 24, 1953 and Nov. 13, 1986, an individual born abroad to a U.S. citizen parent married to an alien could be a “natural born citizen” only if the U.S. citizen parent had lived in the U.S. continuously for 10 years, five of which were after their 14th birthday. If he was born in Kenya, Mr. Obama's mother was only 18 and could not have lived in the U.S. five years after her 14th birthday at the time of his birth. Thus, it became a political necessity for Barack Obama to have a U.S. birth certificate. A forged birth certificate may have been produced in this case on April 27, 2011 because a genuine one does not exist despite the fact that the President was born in Hawaii or does not exist because he was born overseas. For Barack Obama to have become a U.S. citizen under prevailing U.S. law at the time of his birth in 1961, his mother would have had to petition a U.S. immigration court for a naturalized U.S. citizenship status, which would have been readily granted to him because he was born of an American mother. However, by the tragic timing of his birth taking place a few months short of his mother’s having lived in the U.S. for five years continuously after her 14th birthday, Barack Obama never achieved “natural born citizen” status and was as a matter of law constitutionally ineligible for the U.S. Presidency. It is an established fact that Mr. Obama acquired Indonesian citizenship when his mother married Indonesian national Lolo Soetoro, who adopted Mr. Obama and moved his family to Indonesia in 1967. Indonesia requires that its citizens renounce all other citizenships. There is no record, however, that after she sent Mr. Obama to live with his grandparents in Hawaii in 1971 or divorced Mr. Soetero Mr. Obama’s mother ever petitioned for U.S. nationalization of Mr. Obama. 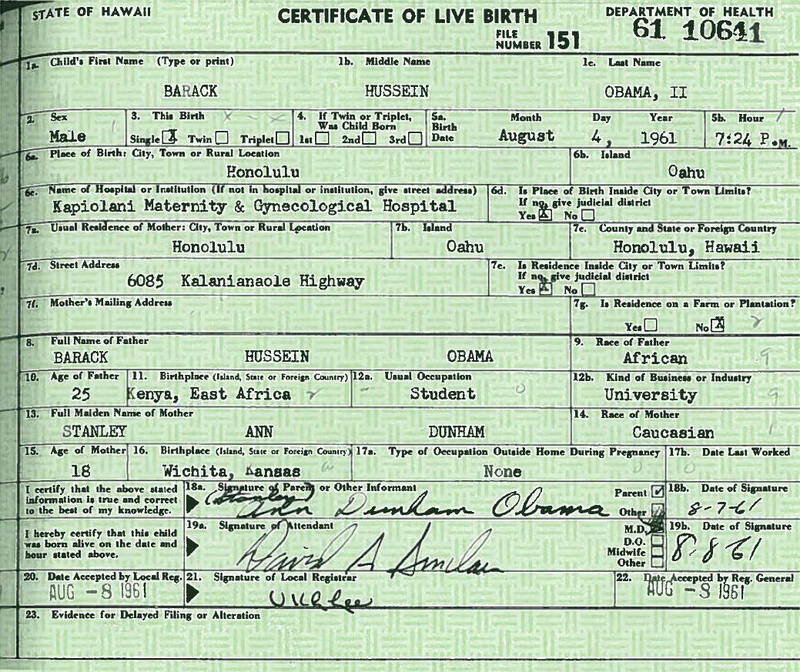 Thus, as a matter of law, even a valid birth certificate showing that Mr. Obama was born on August 4, 1961 in Hawaii would not suffice to grant Barack Obama the “natural born” status he requires to be U.S. President, absent a special statue of the U.S. Congress as was granted his 2008 Presidential rival John McCain. Ironically, in 1986, this U.S. immigration and naturalization law was changed to grant John McCain “natural born” status despite his having been born in the U.S. Panama Canal Zone. The law change permits an individual born overseas to a U.S. parent married to an alien to acquire “natural born” status when born overseas in specific U.S. related facilities and territories. Why such a clumsy forensic forgery in a Presidential birth certificate? During his interview, Mr. Stanley was asked to speculate on the reason for such a clumsy forensic forgery in a Presidential birth certificate, as many independent researchers are speculating on this question. A recent poll indicates that more than 60% of U.S. adults believe that Barack Obama was not born in the U.S., thus potentially disqualifying him to be U.S. President. Mr. Stanley responded that there are many possible scenarios for a clumsy forensic forgery. One scenario was that Mr. Obama was “set up” intentionally by other parties to release a fraudulent birth certificate to embarrass him politically. Another scenario was that the parties that colluded in producing the fraudulent birth certificate were careless and produced a second-rate forgery that could be broken by anyone with a working knowledge of Adobe Illustrator. Is Barack Obama the next Richard Nixon? In his ExopoliticsTV interview (far above video), Robert Stanley calls for a Congressional investigation of the apparent forensically fraudulent birth certificate of Mr. Obama. The White House, and federal agencies such as the FBI and Justice Department, have proved incapable of independently investigating this possible impeachable offence. The production of a fraudulent birth certificate for the purpose of qualifying for U.S. Presidential office would be a “high crime or misdemeanor” under the impeachment clause of the U.S. constitution. The historical analogy that occurred to Mr. Stanley and to other reporters such as Amy Holmes while interviewing Mr. Stanley today for the Washington Times was that of former U.S. President Richard M. Nixon. Mr. Nixon resigned the U.S. Presidency on August 9, 1974 in the face of likely impeachment resulting from the Watergate break-in on June 17, 1972, as a result on an alert security guard who discovered a taped door left unlocked by the Watergate burglars that Nixon himself had sent to steal political intelligence from the Democratic party headquarters at the Watergate Hotel. By analogy, the carelessness of the forged birth certificate of Mr. Obama could be compared to the carelessness of the Watergate burglars who, by leaving the office door to the Democratic headquarters taped, tipped off a security guard that a Presidential-directed illegal search was afoot, which eventually brought the Nixon presidency down. ...from his quantum access time travel pre-identification secret? Robert Stanley and mainstream media journalists such as CNN commentator Amy Holmes agree that the potential significance of the forensic fraud of Mr. Obama’s, if validated, could go beyond the political repercussions of even Watergate. There appears to be another hidden factor beyond the location of Mr. Obama’s birth that is at play here - quantum access time travel pre-identification of recent U.S. Presidents, including Barack Obama. The CIA has been pre-identifying future U.S. Presidents such as Barack Obama for 40 years and has, by the evidence, co-opted each of them into CIA. This secret quantum access program controls the U.S. presidency and makes the United States a functional CIA dictatorship. As this reporter has written, the eyewitness evidence of whistleblower Andrew D. Basiago, the attorney in Washington State who was a participant in the secret DARPA-administered Project Pegasus that developed Tesla technology-based "quantum access" to to past and future events, indicates that it is likely that by 1982 Mr. Obama had been personally informed by CIA that he was destined to be the U.S. President inaugurated on January 20, 2009. The notion that President Obama has had a lifelong affiliation with the CIA is supported by the revelations of crusading lawyer Andrew D. Basiago about a heretofore unknown “quantum access” capability within the US intelligence community provided by time travel technology. Mr. Basiago has been identified as a “planetary-level whistleblower” by the Web Bot for his account of a secret time-space program, Project Pegasus, launched by the Defense Advanced Research Projects Agency (DARPA) in the late 1960’s and early 1970’s. According to Mr. Basiago, by 1970, Project Pegasus was teleporting individuals between locations in time-space via “teleporters” based on the later works of Nikola Tesla and also propagating images of past and future events via “chronovisors” first developed by the Vatican scientists Pellegrino Ernetti and Pier Maria Gemelli. These have been used to provide the U.S. president, intelligence community and military with better information about past and future events by which to engage in better contingency planning for future events. In numerous TV and radio interviews, Mr. Basiago has described how, among other intelligence findings, Project Pegasus was identifying future American presidents and then approaching them and apprising them of their destinies as President. ...shortly after they were informed that Project Pegasus had found via quantum access that they would one day serve as President. We can infer from this meeting between Mr. Obama and Mr. Basiago in 1982 that at age 20 Mr. Obama had already entered into at least a consultative relationship with the CIA, because at the time, the US government was the only country with a time travel capability and the CIA was known to be collecting the intelligence data about past and future events that Project Pegasus was gathering via its time travel technologies. Cui Bono? Who will be U.S. President on January 20, 2013? The operant question as of this writing is whether Mr. Obama’s quantum access time travel controllers have determined that Mr. Obama will be the individual sworn in as U.S. President on January 20, 2013. If CIA time travel has pre-identified Mr. Obama as U.S. President on January 20, 2013, then the “secret team” behind Mr. Obama may be taking a calculated risk with the newly released Obama birth certificate that there are enough Obama supporters in the main stream media through Operation Mockingbird and otherwise, and in the population, that the issue “will go away” or can be argued away on the basis of the technicalities of U.S. immigration and naturalization law. If, on the other hand, Mr. Obama’s CIA quantum access controllers are aware through time travel pre-identification that some other individual is to be sworn in as U.S. President on January 20, 2013, then a crude and obvious forgery may be a perfect way to commence an internal “coup d’état” with outcome as yet unknown. Joe Biden, Vice President of the United States, is most certainly a “natural born” citizen and a party loyalist. Throughout this entire process, whatever the outcome (whether Mr. Obama stays or leaves as U.S. President), the principal objectives of the CIA time travel controllers and their loyal sycophants in the mainstream media will be to maintain the secrecy of the CIA's quantum access capability, and their secret control over the U.S. Presidency.